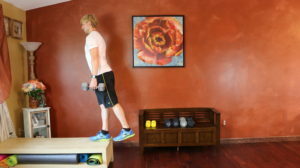 It’s workout time again, and I am excited to bring you a brand new workout. 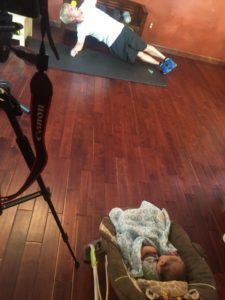 I’m only 1-week postpartum so I won’t be teaching new workouts for a little while, so Jesse stepped out in front of the camera again for today’s workout. 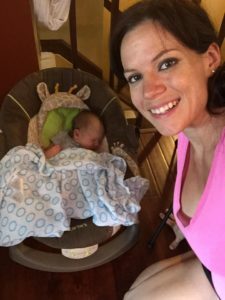 I can’t wait until I am cleared for exercise, but I am enjoying just focusing on my newborn baby right now. Maverick watching his Daddy film a BenderFitness workout. 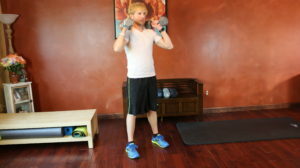 This is a full body dumbbell workout, designed to build strength and power while sculpting your body. 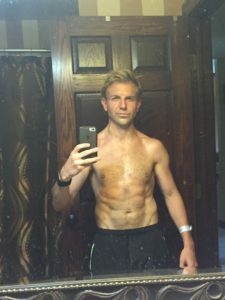 Jesse is a runner, so for him it’s important to maintain lean muscle mass without adding bulk. When you are running 5-minute miles having too much muscle mass will just slow you down. However, to little muscle on runners leads to injury, poor form, and decreased endurance. 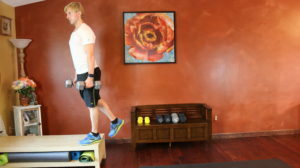 Lean muscle mass helps runners maximize Speed, Power, Form & Endurance. Today’s workout is completed for repetitions instead of intervals. Select the level that is most appropriate for you. If you don’t have dumbbells you can complete the exercises without them, but the added resistance really increases the intensity. 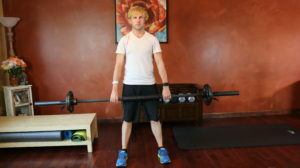 When selecting a dumbbell you want to choose a challenging weight. The last few repetitions should be tough to complete, but you should be able to do it while maintaining form. Equipment: Dumbbells & a Chair or Bench you can step on safely. Will try tomorrow!! All my children love fitness, they have been watching me and my husband since they were young. Also this year my oldest will be running cross country. I am so happy for your new little family. It has been great following your journey these last 9 months. 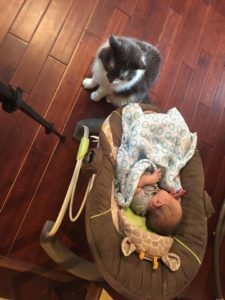 I know you are even more busy, but I would love a new mom update and hear about your labor experience. Thanks for the great workout! Congratulations on the sweet baby. You look great Melissa. I LOVED the workout. I am so happy to see you and Maverick at the beginning of this video. So glad to have Jesse filling in for you. You look amazing. Congrats and keep up your strength. We like to see Jesse in front of the camera too every once in a while 🙂 Have a great Tues!! This is the cutest video you’ve ever made! 😀 Three of you and the cat make a fantastic family together :)) Very inspiring and excellent workout. thank you! Just did 1 round 😀 sweating like crazy I wanted to start a 30 day challenge so I’m going to finish two rounds of other combined from the 30day 🙂 Thank you guys for sharing for free that is awesome. 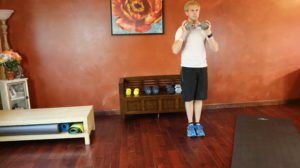 I discovered you Melissa on youtube last week while looking for a runners stretch video! The king arthur is a killer stretch thank you!! That’s one of my favorite stretches! Glad you liked it!